in their off hours, like Manhunter or The Woman in Red, did. Nor are they private eyes, like Sam Hill or Johnny Dynamite. No, they're full-time police officers, even tho they do it on a freelance basis. They get their orders from The Commissioner, with whom they have an ongoing contract for their freelance police work, but there's no way of knowing exactly what he's commissioner of. As often happens with freelancers and the sometimes-distant people they work for, they've never met face-to-face. Sam and Max were created by cartoonist Steve Purcell, who also did minor work at Marvel on Woverine and The New Mutants, and at smaller publishers on Hellboy, Scary Godmother and more. He also did some work on Fish Police, and it was their Fishwrap Productions that originally published the freelance cops in comic book form in 1987. Two years later, their initial comic book special was taken over by Comico (Grendel, The Elementals). 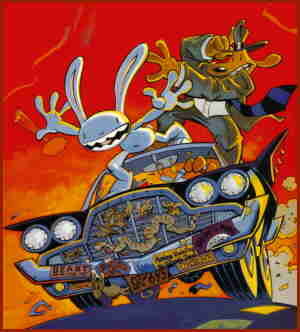 Sam and Max weren't traditional funny animals, in that they were brutally violent (but in a funny, not horrifying way, like Lobo or Daffy), as regular police can get away with only by adopting the stratagem of The Blue Beetle and The Guardian, and operating outside the law to enforce the law. They were also too violent for TV when organizations like Action for Children's Television held critical power over children's programming. But shows like Beetlejuice and Ren & Stimpy paved the way for programmers to break free of their influence; and by the next decade, the airwaves were ready for an animated version of The Adventures of Sam & Max: Freelance Police. That show debuted in October, 1997 on Fox Kids' Network (The Tick, Bobby's World). It was produced by Nelvana Ltd, (Eek! the Cat, The Get-Along Gang), the Canadian producer that named itself after an early Canadian superhero. Sam's voice was done by Harvey Atkin (Bumboo in Sailor Moon, Crag in The Ripping Friends) and Max's by Robert Tinkler (Grub in Miss Spider, Grumpy in Care Bears). In neither form were the freelance police break-away hits. The show was on the air for only six months. In comic books, they turned up once in Munden's Bar, where Grimjack hangs out, but haven't been seen in about 20 years. Text ©2008-09 Donald D. Markstein. Art © Steve Purcell.